A mission to test satellite servicing techniques took a giant leap forward in a 300-mile-high space ballet Saturday, when two spacecraft separated, spent an hour flying in tight formation, and automatically docked together again. The demonstration is part of the U.S. government's Orbital Express program. The mission consists of ASTRO, a robotic servicer, and NextSat, which plays the part of both a fuel depot and a client satellite. The mission aims to demonstrate in-orbit refueling and servicing, which could be employed by satellite operators to increase the lifetime of their spacecraft. Saturday marked the first time the two craft were fully separated. The satellites conducted earlier operations while attached by a capture mechanism or ASTRO's robot arm. 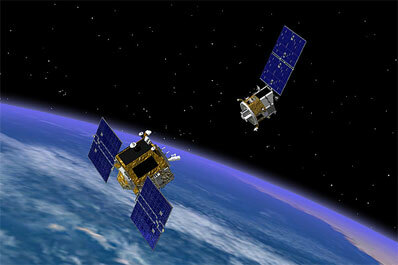 ASTRO and NextSat flew apart to a distance of about 10 meters, or approximately 33 feet. 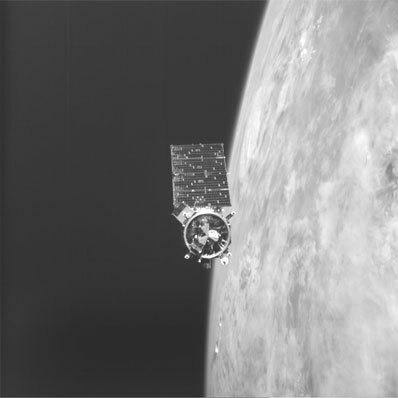 The two held position for around one hour, then ASTRO closed in and docked with NextSat. Most of the activities were performed while the satellites were out of contact with ground controllers, according to the Defense Advanced Research Projects Agency, which oversees the $300 million mission. ASTRO used on-board guidance and navigation instruments for the test, allowing it to complete its objectives without input from the ground. Mission goals for Orbital Express include demonstrating autonomous rendezvous systems. Still pictures from ASTRO were compiled to produce a video of Saturday's events. Saturday's operations were part of Scenario 2, the third of nine increasingly complex procedures planned for the mission. "We sort of do a crawl-walk-run," said U.S. Air Force Lt. Col. Fred Kennedy, DARPA's Orbital Express program manager. Scenario 0, which involved transfers of hydrazine propellant and a spare battery between the two spacecraft, was completed April 13. The hydrazine can be transferred both to and from ASTRO and NextSat using pump- and pressure-fed methods. The battery and a spare computer are called Orbital Replacement Units, or ORU's. During Scenario 1, ASTRO's Canadian-built robotic arm grappled NextSat and moved the 500-pound craft off its attachment ring, which had connected the two satellites since their March 8 launch. The ring was jettisoned April 17 to prepare the docking system for later use. ASTRO and NextSat later completed another series of fuel and ORU transfers before beginning more ambitious unmated operations this month. Officials expect to carry out two additional transfers of hydrazine fuel later this week, according to Jan Walker, DARPA spokesperson. The next milestone is scheduled for late this week, when ASTRO and NextSat will undock and separate to a distance of up to 100 feet, Walker said. The two satellites will later conduct rendezvous operations from up to 200 feet before ASTRO performs a circumnavigation of NextSat later this month. These scenarios will lead to the mission's grand finale, a daring sequence taking ASTRO and NextSat more than four miles apart. ASTRO will close back in on NextSat, dock, and then complete another string of fuel and ORU transfers. "In that last scenario, it's like if you go out to your car, push a button, and the car autonomously drives to the service station, the fuel tank autonomously comes in and refuels you, and then (the car) autonomously takes you back to your garage," Paul Geery, Boeing's Orbital Express program manager, said in a pre-launch interview.